Model numbers in Red are IN STOCK and features QuickShip! 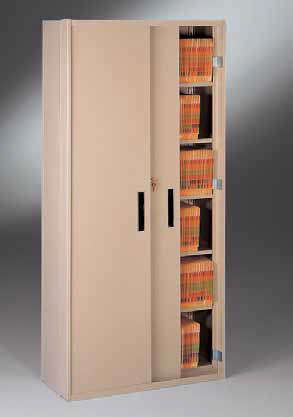 Tennsco Imperial Shelving Systems, the most economical method to file end-tab file folders, keeps materials upright while making files more visible, especially when using a color-coding system. All units have closed end panels. Each shelf comes with 5 adjustable dividers and plastic feet to protect carpet or floor. It also offers a variety of doors that meet HIPAA (Health Insurance Portability and Accountability Act of 1996) healthcare privacy regulations for safeguarding personal health information. Tennsco offers two options to secure business and medical documents. Choose from Hinged Style Locking Doors or Sliding Locking Doors. Door options can be added to new or existing installations. Each meets HIPAA healthcare privacy regulations for safeguarding personal health information. Includes: 2 shelf supports, 1 shelf, 1 backstop and 5 dividers.